As we enter the holiday season, the weather is about to get colder, and the roads may start to get snowy and icy. 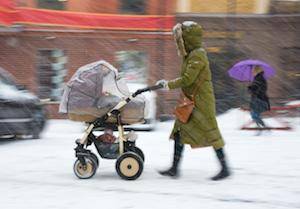 These conditions increase the risk of car accident injuries for everyone who uses the road, but pedestrians are often in the most danger during the winter season. In cold weather conditions, both drivers and pedestrians should take extra care to prevent potential pedestrian accidents. In 2015, more than 5,000 Americans were killed in pedestrian accidents. On average, one pedestrian was killed in an accident every 1.6 hours. In the same year, approximately 129,000 pedestrians were admitted into emergency rooms for injuries related to car accidents. Pedestrians are 1.5 times more likely to die in a traffic accident than those in a car at the time of the accident. People over the age of 65 accounted for 19 percent of all pedestrian accident deaths and 13 percent of all injuries from pedestrian accidents in 2015. One in every five children under 15 years old who were killed in car accidents in 2015 were pedestrians. Drivers should be aware that driving at higher speeds increases the chances of a pedestrian being hit by a car and the potential of severe injuries or death. Pedestrian deaths are most likely to occur at night, in non-intersection locations, and in urban areas, so drivers should take care to watch for pedestrians in these situations. Look left, right, and left again before crossing a street. Keep looking both ways until safely across. Do not use a phone, headphones, or other technological devices when crossing the street. Walk on sidewalks or designated paths to avoid oncoming traffic. If there are no sidewalks available, walk as far away from traffic as possible. Minor children must cross the street with a responsible adult. If you or a loved one have been injured in a pedestrian accident, please contact Flaherty Law. Attorney Daniel Flaherty has over 10 years of experience in personal injury law, and he will provide you with the legal representation you need to obtain the compensation you deserve. Call a Will County pedestrian accident lawyer at 815-577-7500 for a free initial consultation.